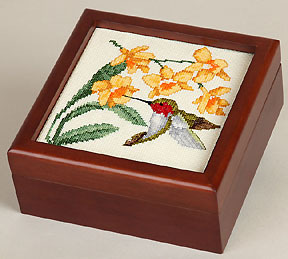 Sudberry’s wood products are popular for needlepoint because it’s so easy to use them to finish items yourself. I’ve used them most of the time I’ve stitched needlepoint (over 40 years). There’s just one drawback to them — they come in a limited number of colors. The box I’m using for my tree of hearts is only available in one color — mahogany. That color may not work with your design. Can you customize the box to what you want? Today we’ll look at ways to do this. Next week I’ll have a tutorial on what I did to customize my box. It’s just wood so you can paint or refinish it to the color you want. Stains: Stains are transparent and allow the grain of the wood to show through. This affects the end color of your stain. The type of wood also affects the color because stain penetrates the wood to color it. Woods with tight grains, for example cedar, don’t take stain well. If you stain, it needs to be a color darker than the color of the wood. Paint: You can use acrylic paints, even house paint, to color your box. These will usually be opaque and will hide the grain of the box. If you want color but grain, choose a different product. Hobby paints (the cheap ones in bottles) come in many different finishes, including metallic and opalescent colors. Precious Metals Leafing Glaze is a new-to-me product that is a metallic paint. Because it supposed to mimic leafing, it probably gives a better metallic finish than bottled metallic acrylics. It also comes in an “antiquing” finish which you apply as a second coat to make your initial metal look older. Process: You’ll get the best results if you sand the wood first to remove color and varnish, if any. You want to sand at least twice, once to rough it up and then once with a finer grit paper to smooth the surface. Apply your color. Once done seal it with polyurethane varnish in the finish (matte to gloss) you want. I’ve used these for years, generally the brand Rub & Buff. Other paste colors are Jeweler’s Paste and DecoArt’s Metallic Lustre. These products have color, usually a metallic, embedded in wax. Rub & Buff can be hard to find but I prefer it to Jeweler’s Paste colors which have a strong smell. Metallic Lustre comes in some fairly bright semi-metallic colors (think Kreinik colors) as well as metallic finishes. The others come in metallics and colors that are more strongly metallic, such as red with gold undertones. Process: Using a rag. because this stuff stains, put it into some of the paste onto the rag, but not much. Rub it only the wood (you don’t need to sand first). Use a clean soft cloth to rub off any extra wax. Seal the wax with a sealer to keep it from rubbing off. Once the color is applied, use another clean soft cloth to buff the finish to a soft glow. This ink pad has a pigment based ink and is designed to create a chalky effect when dry (I couldn’t tell from what I read if this happened with or without water. Designed to work on paper I could find nothing about whether it worked on wood. Distress Oxide is not the same as Distress Inks which are made by the same company. I’m trying it out on the inside of my box and will let you know. Next Monday, come back for a step-by-step to see what I did.